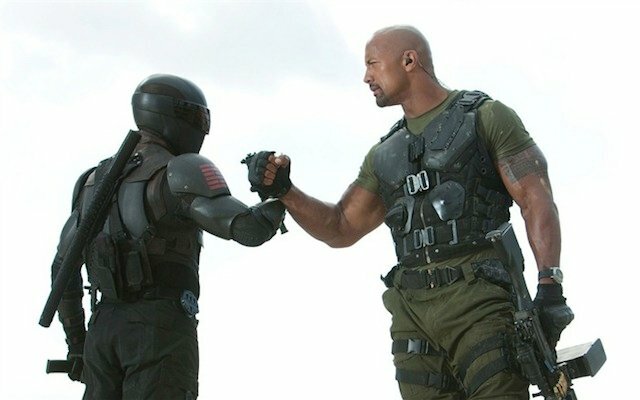 G. I. Joe: Retaliation could best be described as formulaic, in that it seems like it was made from a recipe. Take two parts Bruce Willis and Dwayne “The Rock” Johnson, and mix for 100 minutes. Add Channing Tatum to focus group audience taste. Bake for nine months, and serve mild. 2009 was the year Hasbro announced itself to the world as the Guns N’ Roses of terrible cinematic source material. Transformers, the 2007 adaptation of the popular plastic robot line, was their Appetite for Destruction, both for how readily the title speaks to director Michael Bay’s pyrotechnic obsessions, and for being a wildly successful taste of things to come. Then, 2009 came along, and Hasbro had their Use Your Illusion I & II moment of awful brilliance –Transformers: Revenge of the Fallen, and G.I. Joe: The Rise of Cobra, released within two months of each other, with a collective Rotten Tomatoes score of 54% approval, and over a billion dollars at the global box office. If you know your G N’ R well enough to have followed this metaphor thus far, then you might be wondering which film would be the equivalent of Guns N’ Roses’ long-delayed, thoroughly disappointing Chinese Democracy. G.I. Joe: Retaliation is that film. The most obvious symmetry between the two is temporal; like Chinese Democracy, Retaliation has been in the works for what feels like forever, at least in Hollywood time. It is, after all, the sequel to a much maligned (but, more importantly, profitable) summer blockbuster, and seemed primed to make off with more audience loot back in June of last year. Then, Paramount did the unthinkable, and delayed one of its only summer features nearly a year, barely one month before the film’s slated release date, and after a no doubt expensive ad campaign. If nothing else, the collective “huh?” that went up around the industry got people talking about a movie many had written-off. As it turns out, the other major overlap Retaliation shares with Chinese Democracy is that it barely has any connection to the work that came before it. You wouldn’t think it in passing, though. G.I. Joe Retaliation operates within the same framework as the original, one where elite army men called Joes battle the nefarious forces of Cobra for the good of the planet. There are still bountiful explosions to be witnessed, lots of brain dead one-liners to be endured, and an extreme reverence for the spirit of the 80’s cartoon… in that the whole thing feels like it’s designed to sell toys. And yet, Retaliation treats the landscape and universe of the original with the care of a retreating Russian army, laying waste to everything, and everyone established thus far in the Joe “mythology.” The film operates in the squiffy gray territory of a seq-boot, amputating what little of the first film audiences responded positively to, and then grafting those scraps onto something else entirely. To that end, most of the original cast has been discarded like last Christmas’ toys, partly in an effort to try something new, but also because guys like Joseph Gordon-Levitt and Channing Tatum no longer have to stoop quite so low to cash a big cheque. Oh, how times have changed:, word is, the film’s delay was due to the studio adding more scenes with Tatum, who rose to prominence as a leading man in other, non-Joe related films in 2012. There’s something oddly romantic about invoking the Old Hollywood belief that star power is all that matters, but even Johnson – who shines (glistens, really) brightest in an ensemble, and has arms that, like old action figures, would pop off if raised more than 100° -, isn’t the man for this franchise rescue mission. For those of you willing to admit it, you’ll remember that the first G.I. Joe film ended with the cliffhanger of Cobra Commander replacing the President with his chameleonic underling, Zartan (Jonathan Pryce). After Tatum’s Duke, and his merry band of troopers successfully raid a terrorist compound in Pakistan, they wind up on the wrong side of some government apaches, leaving most of the Joes dead, and the few remaining survivors disavowed. With the help of super-ninja/Daft Punk-cosplayer Snake Eyes (Ray Park), and the original Joe himself (Bruce Willis), Johnson’s character must rise to the challenge, fight back the forces of Cobra and blah blah, space laser, blah blah nuclear football. It shouldn’t surprise you to hear that Retaliation is not a heavy-hitter in the characterization, or plotting departments, and that roughly half the dialogue is people grunting “hooah.” This is a big dumb action movie through and through; the problem is that it’s neither big enough, nor dumb enough in the right way, to be much fun. The dirty secret I need to reveal is that I will be among the few actually disappointed by Retaliation. The original is not a good movie by empirical estimations, but it is an enjoyable one in ways that most cinematic confectioners aren’t. It was unrepentantly silly, and willing to embrace its source material with just the right hint of embarrassment. 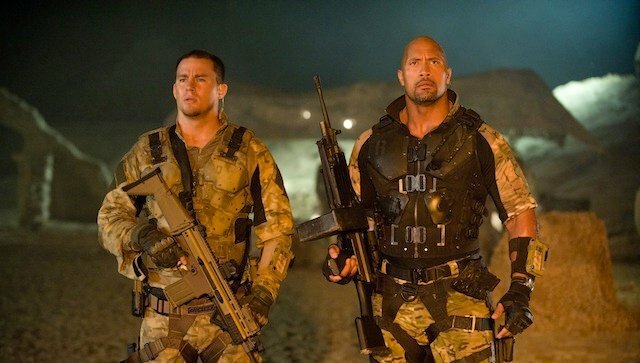 Retaliation forsakes all the low-impact, Saturday morning breakfast cereal charm of the first film for military fetishism, and attempts at current political grounding that couldn’t jibe more with the fact that THIS IS A MOVIE BASED ON A LINE OF ACTION FIGURES. Why is North Korea’s nuclear capabilities a running gag in a film that features a motorcycle which doubles as a literal crotch rocket? When Willis’ character unveils his secret stockpile of guns by punching in the code 1776, who is that joke supposed to be for? How are we supposed to buy any part of Lady Jaye’s (Adrianne Palicki) speech about the difficulties of being a woman in the military, when the camera does more to objectify and oversexualize her than most of the characters? Retaliation has flashes of the first film’s inoffensive, spectacular stupidity, including an animated prologue that opens with a line as beautifully campy as “5 years after the Nanomite Wars,” and an almost inexplicably disconnected subplot featuring the RZA as a blind ninja master, but it’s not nearly enough. Jon Chu’s blurry direction does the by-the-numbers action scenes few favors, and the reduced budget is evident in all the scenes that play out in empty warehouses, or just regular houses. By the time the film does finally cut loose for the finale, that includes London being turned into a concrete wave pool, it’s hard to feel much excitement. Say what you will of G.I. Joe: The Rise of Cobra, it at least had courage in its misguided convictions. G.I. Joe: Retaliation shows no such bravery. It’s the disjointed, bland result of too many cooks being in the kitchen – or rather, too many moneymen nitpicking the cash-grab.